With the Affordable Care Act beginning its Healthcare Exchange January 2014, millions of Americans living below the poverty line will be left without access to the new “metal plans”: Bronze Plan, Silver Plan, Gold Plan, and Platinum Plan. Who is Eligible for Federal Subsidies? 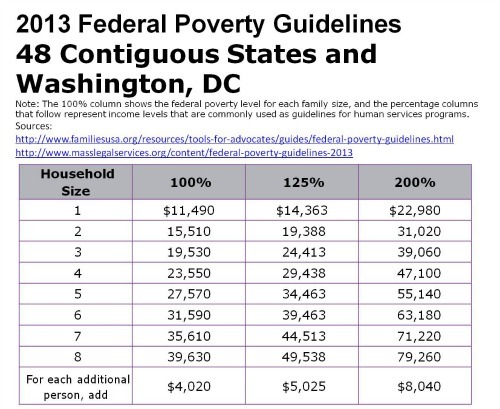 Federal subsidies begin at the Federal Poverty Line (FPL) of $11,490 and go up to 400% of the FPL at $45,960. These persons may be eligible for federal premium subsidies and possibly federal cost-sharing subsidies. How many Americans are Ineligible for Subsidies? Many Americans living below the poverty line will not be able to receive federal subsidies, Medicaid, or other state and federal help with insurance. This leaves an estimated 5.7 million uninsured, because they live in states that have blocked the expansion of Medicaid. Among these states are: Texas, Florida, Kansas, Alabama, Louisiana, Mississippi and Georgia. These Americans are eligible for healthcare insurance help if they lived in a neighboring state.